﻿The "Alto Rhapsody", "Song Of Destiny" and "Song Of A Wayfarer". Each of these three vocal compositions is unique in its expression and construction, yet the frayed emotional worlds of all three works are connected by a multitude of fine threads. The "Alto Rhapsody", which Brahms wrote as a wedding gift for Clara Schumann’s daughter Julie, in whom he was himself in love, demonstrates with almost Wagnerian weight the anger that the disappointed Brahms must have felt while composing. The "Song Of Destiny" too, with its sonorous E major waves of harmony, soon announces in C minor the finiteness of existence as Hölderin’s poem demands. That finally a hopeful, conciliatory – though unsure – moment lingers is reflected in the musical means. Many emotions and vagaries are emulated in Mahler’s song cycle. The journeyman sets off on his wanderings in order to forget his unhappy liaison and strides through the ups and downs of mixed emotions and painful heartache. Drumrolls and march rhythms reflect the real world and sounds of nature, dissonances and a change between major and minor keys show the way from dreams, reality and feelings. 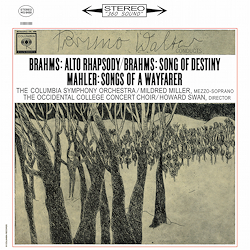 The recording with Mildred Miller and the Columbia Symphony Orchestra under Bruno Walter has achieved reference status and is sure of a place in the TAS Super LP List given out by "The Absolute Sound".